“Début” represents the creaking and scraping and hissing of something heavy lumbering into wakefulness - a long-dormant machine, perhaps. It’s an impressive display of power, and a good example of what makes Platform such a formidable group. Consisting of Xavier Charles on clarinet, Katrine Schiøtt on cello, Jan Martin Gismervik on drums, and Jonas Cambien on piano/Casio SK1, Platform have been active for several years, honing their craft and strengthening their grasp on the billowing improvisations and textural journeys that are everywhere in evidence on Flux Reflux, their first recording for Clean Feed. 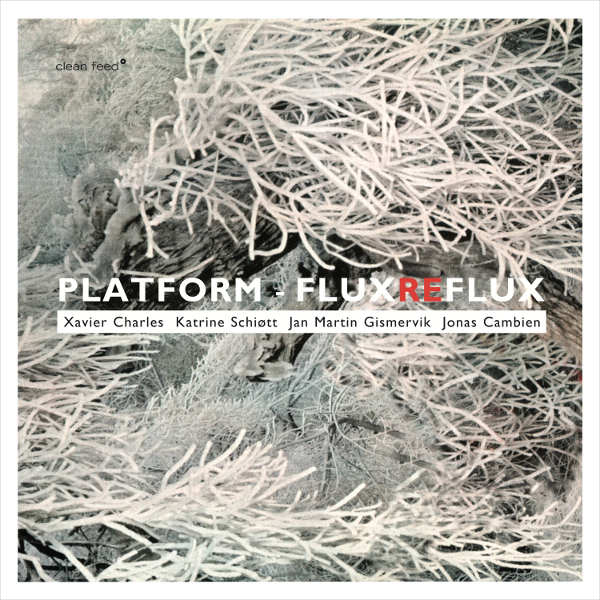 Coming right after the icy opener, “Flux” sees the group taking a more distinctly rhythmic approach; Cambien’s sparse notes drip down like beads of water from stalactites, and the soft rustling of Schiøtt’s cello provides a steady drone that lends the piece a trance-like quality. “Reflux” is a quivering beast, quietly restrained but constantly scratching at the loose threads that keep it bound. Gismervik never lets his drumming rise above a nervous thrum, and Charles’s clarinet whistles, whines, and warbles the whole way through. Once again, “Reflux” is characterized by its regular pulse; in more ways than one, then, the pieces here are “alive,” with each player taking on a singular role that helps keep the entire organism functioning. “Interlude” is what happens when that same organism sinks into revelry, a slowing of the pulse and a gradual displacement of thoughts - it’s a murmurous sea that you can’t help but find yourself immersed in. The centerpiece of sorts is “Ce que le vent d’ouest n’a pas vu” (“What the west wind has not seen,” a play on Debussy’s oppositely-titled composition). With Cambien’s motorized plunking acting as a kind of metronome, the other players swirl in and out of the piece - the cello with quavering bouts of vibrato, Gismervik in subdued throbs, and Charles with his ever-intense caws. Eventually, the rhythmic center gives way to an impressionistic second half that is thoroughly absorbing. On the surface, it may seem a bit static and dull, but close listening in a noiseless room will lay bare all of the tonal and textural intricacies that Platform have strung together here. 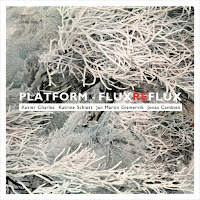 Flux Reflux is a lovely, if slight, monument to sound design and improvisation. Because of all the subtle touches that it contains, however, it’s probably best to reserve at least one or two listens for a quiet place; do that, and you’re sure to find yourself transfixed by the sounds these four musicians have made for us.